Here I am with my sweet family! This past year has been a big one for us, full of changes. Matt completed his first year of his Master's program, we moved house, then grew our family to four in June, and have just finished a tough semester, the second to last towards completion of Matt's Master's degree. We are awed by the faithfulness of God when we look back over the year. The timing of many of those big changes shows a plan that surpassed our understanding at the time. The trials and struggles that we were faced with over the last year have grown us in faith that God is watching out for us and walking alongside us even when we can't see how He is working. 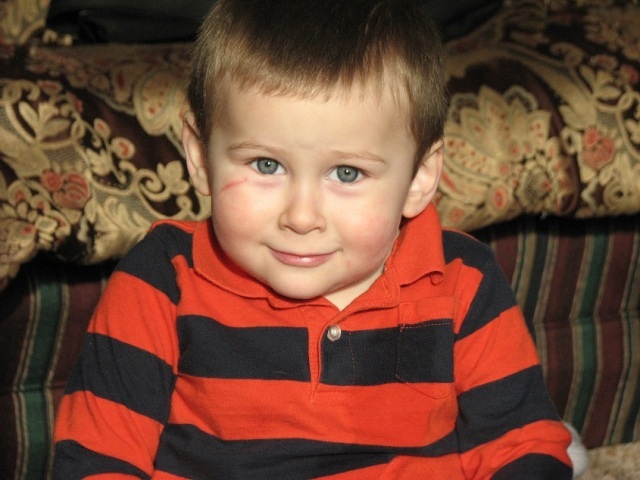 Speaking of growing, it is hard to believe we are now parents of a two-year-old. 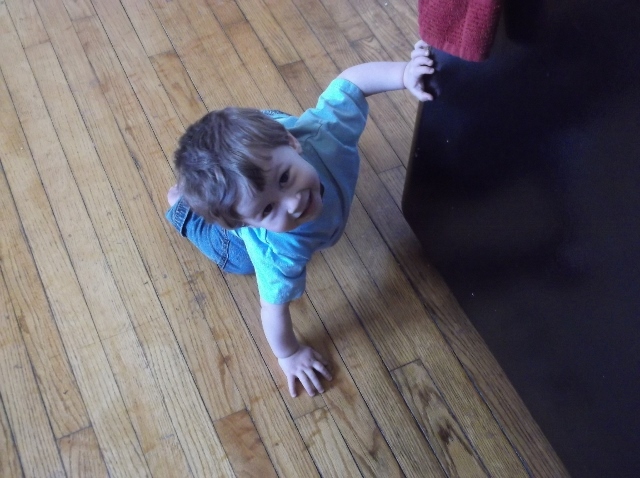 Ger has learned to run, give high-fives, identify some colors, count with help, and use his beloved stool to get up to the counters to help with baking, among the many other skills he's picked up. 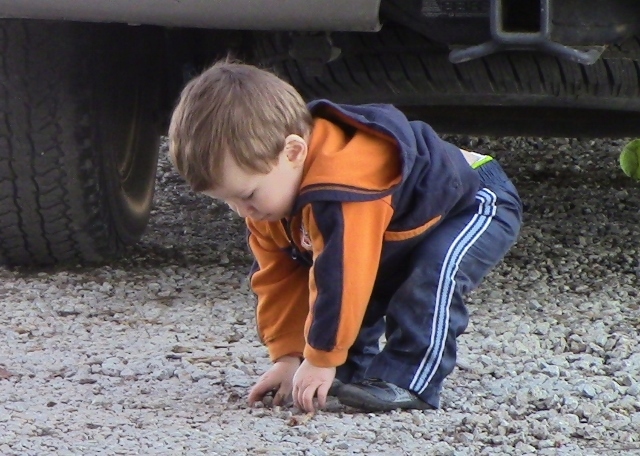 He delights in all things outside and thrills to point out rocks and trees and trucks and dirt (especially dirt!). 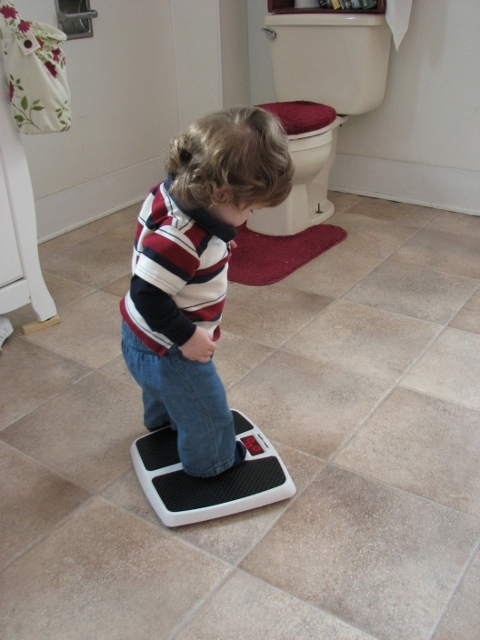 We are learning more about our own characters and flaws while parenting him than we ever wanted to! 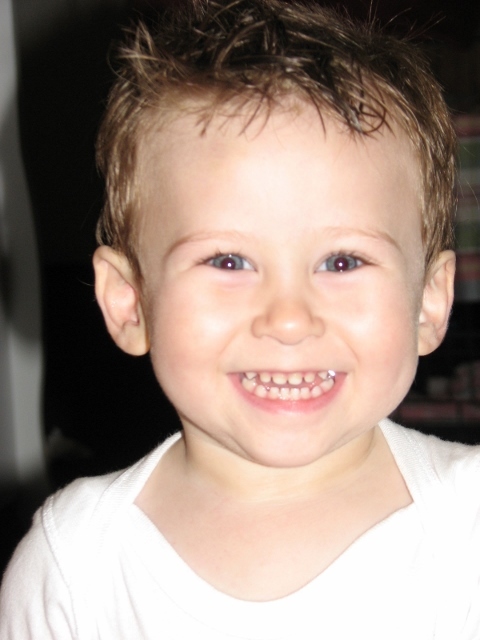 Ger has shown himself to be a very sweet, sensitive, tender young mind, though still the normal boisterous and inquisitive toddler. He definitely keeps us on our toes! 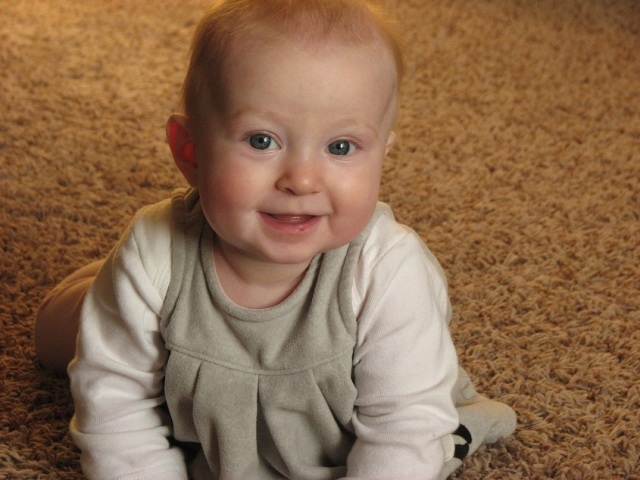 Since arriving in June, Eldora Rose has blessed us with her sunny personality and adorable smiles. She seems to be growing up faster than Ger did at her age. Where we waited and waited for Ger's milestones, Ellie's take us by surprise! Already she is starting to sit up and think about crawling! She is a precious addition to our family; we can't imagine life without her. We have another big year full of changes ahead of us. We are hoping to graduate with a Master's degree in Animal Sciences in May from the University of Illinois, and then be off to the next step in Matt's schooling, working towards a PhD. We have applied to Purdue University in Lafayette, IN, and will likely be moving there sometime this coming spring or summer. Contemplating moving an hour and a half away is both an exciting and scary prospect; both of us have lived in this general area most of our lives! Are we ready to stretch and grow some more in our faith and trust in God? I guess the next year will show! Hope you had a merry Christmas and a blessed New Year!! Well, here we are on the other side, snuggling a little angel and settling into life as a family of four. 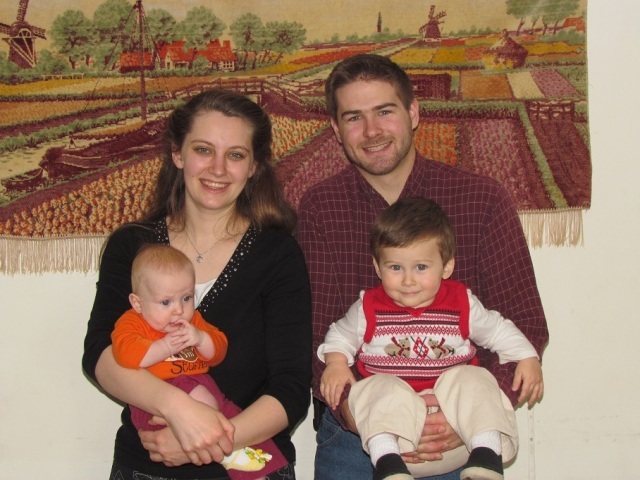 On the 25th, Beka (Matt�s sister) came in the afternoon to help with Gerald and stay the night. We all went for a walk to the park around 7 pm. Just as we got there, I started feeling some discomfort in my tailbone. We sat down on a bench for a little, and I just got increasingly uncomfortable. Shifting positions didn�t help much, so we got up and tried walking a little bit. Walking hurt. I told Matt I didn�t think I was going to make it home, so he left to get the car. I found a grassy spot and laid down on my side. By this time I was worrying a lot about the baby possibly being posterior and putting pressure on my tailbone, hence the pain. Beka and I waited and watched Ger push his stroller around until Matt came and we got in the car. Lying down had been the right thing to do; I wasn�t in pain when I got up. Back home, now very concerned about the possibility of posterior labor, I spent the next 45 minutes or so on hands and knees or leaning on the birth ball, doing pelvic rocks and hip sways. I occasionally felt a little bit of pain in my tailbone when I�d get up, but the same pain I�d felt at the park never returned. Thank goodness! We headed to bed around 9ish. Matt and I talked for a while. 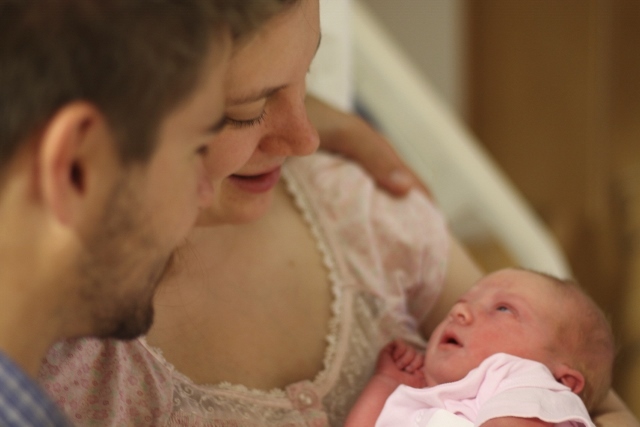 My dear husband was feeling kind of upset and discouraged that the baby hadn�t come already; he was starting to feel that she was never going to come, after three consecutive nights of prelabor and false alarms. I did my best to encourage him, though I was struggling to not feel the same way. We ended up going to sleep sometime between 10:30 and 11. 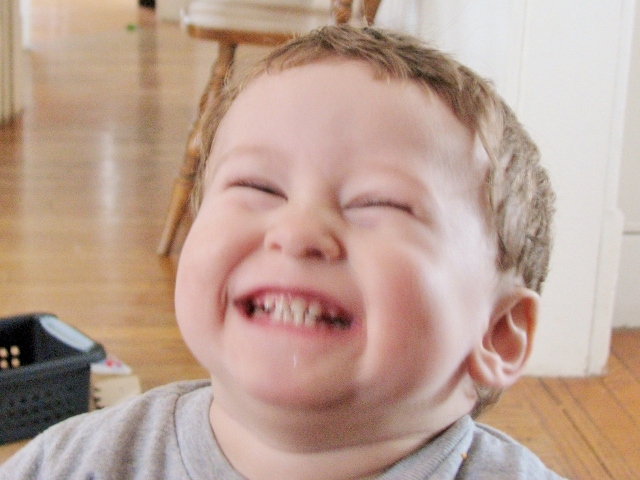 I woke up to a pretty strong contraction and rolled over to the clock reading 11:58. Another contraction hit a couple minutes later, then another. I breathed through them as best I could. Some were bad enough that I moaned just a little through them. They had picked up exactly where they had left off the night before, and were ramping up quickly. I aimed for an hour of laboring in bed and made it, though they were intense enough at that point that I needed to get up. 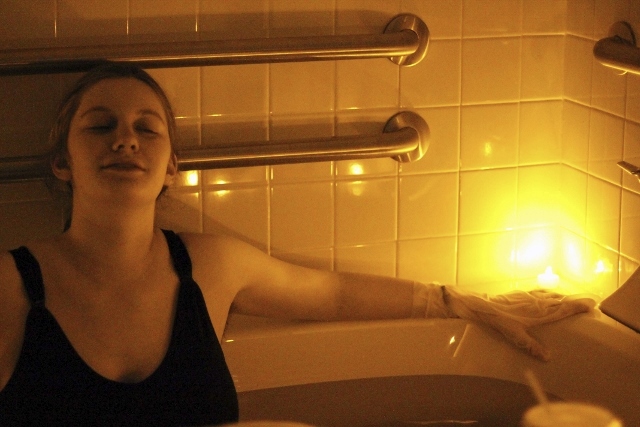 I wanted to let Matt and Beka sleep as long as possible after the lack of sleep the night before, so I started a bath and settled in to try laboring for another hour in the tub. I only made it twenty minutes. I woke Matt up. �I need help, I can�t do this alone anymore!� He awoke in a half-second and started pulling on clothes while I got back in the tub. He started timing contractions�by this time they were strong enough that he could tell by my vocalizations when they were starting. We timed contractions for a little bit; they were pretty regular around 3-4 minutes apart. At first I told him I wanted to hold off calling Mom Aardsma and Trish, our doula. Two contractions later I told him he�d better call them, and tell Mom to hurry since she had a little bit of a drive. Matt woke Beka up to time contractions while he tried to call people and get packed up. 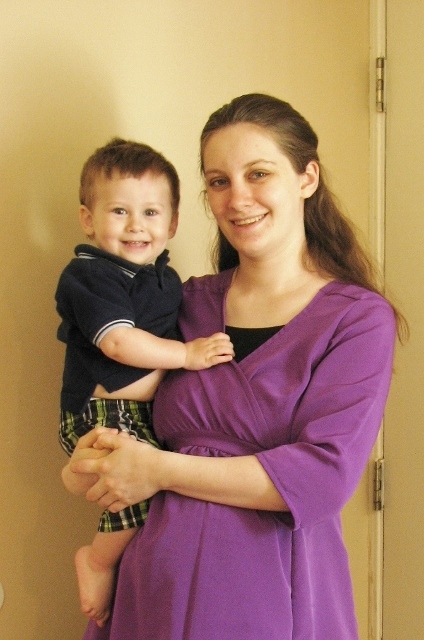 He couldn�t get through to Mom, couldn�t get through to the doula. 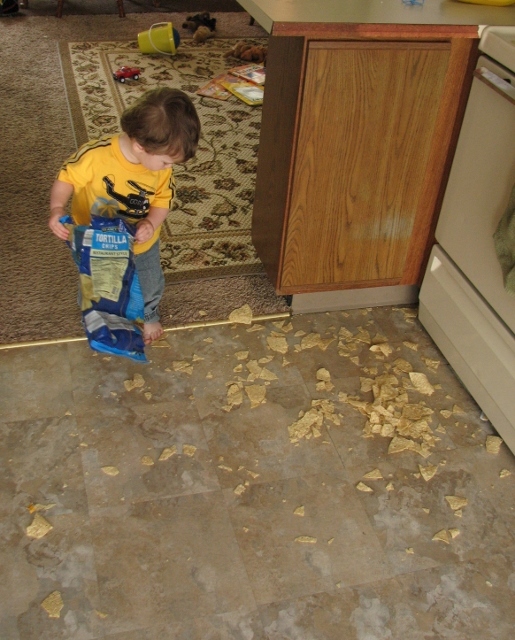 He was running around throwing the last minute items in bags and getting Ger�s stuff ready for Mom and handling the phone calls all at once. He finally got through to Mom and told her to come. He also called Labor and Delivery to let them know we were coming soon. Trish texted and said she was with a different client in labor. Her backup Sue would be contacting us. Ger started waking up right about at that moment. Sue called my phone and Beka handed it to me in the bathtub. I tried to talk to her but then a contraction hit. I couldn�t talk, and instead vocalized through the contraction. 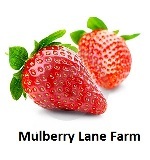 I picked up the phone again and Sue said something like, �That sounded like a pretty good contraction!� I tried to talk to her but I don�t think I was very coherent, as Sue asked to talk to Matt. Matt had laid down with Ger in hopes he would not wake up; he and Beka traded spots so Matt could talk to Sue. Mom texted and said she was on her way; we told Sue we were headed to the hospital and to meet us there. 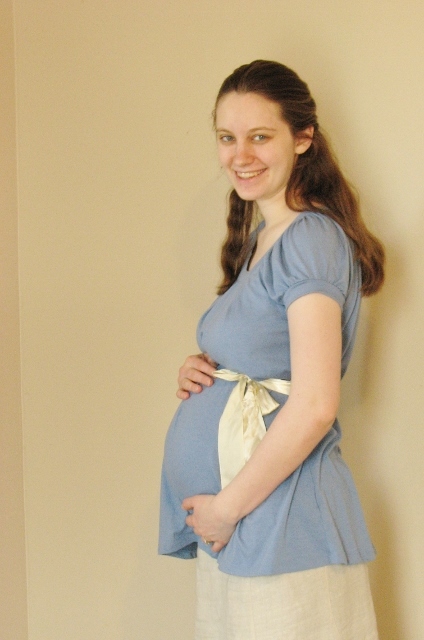 I got dressed in my nightgown and worked through several more contractions sitting on the birth ball. I tried to drink and eat a little. I managed to eat one cracker; it tasted like dust in my mouth. Matt finished packing up and pulled the car up to the house. He walked me out and we left together for the hospital at around 2:30 am.The ride was short; there were very few cars out. I only remember one contraction in the car; I pulled myself up on my knees and leaned over the backseat. I felt every bump exquisitely. We pulled up to the ER, unsure where to park. A fairly small woman walked up and introduced herself to Matt: this was Sue, our doula for the birth. I got out of the car and walked in with her while Matt parked. I was pretty mentally foggy by this point. I somehow managed to check in-- I can�t remember if I had a contraction in the receiving area or not. Someone asked how far along I was and my response was �I don�t know�contractions are 3-4 minutes apart,� thinking that they were asking how dilated I was. 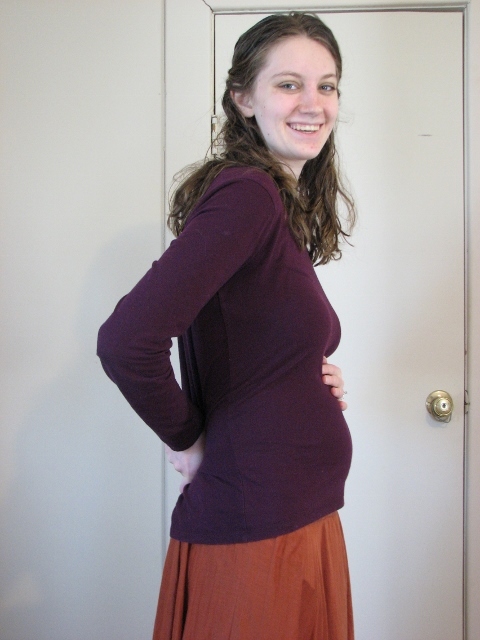 The follow-up clarifying question was �How many weeks are you?� I was relieved that I could answer that my due date was just a couple days away. A couple of male nurses showed up with a wheelchair and said they would take me to my room. 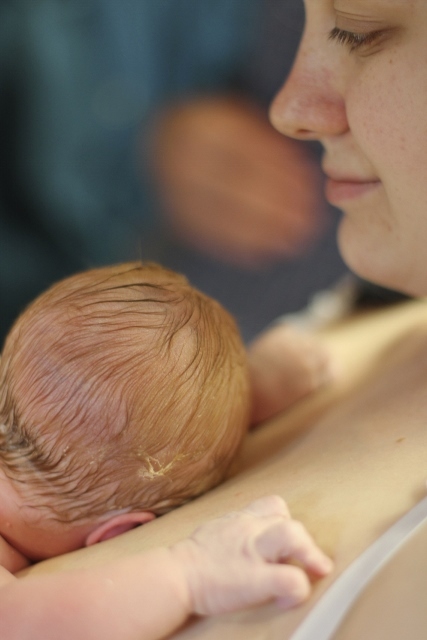 I was still waiting for Matt, and was a little out of it�Sue was amazing; she stepped right in and said she could handle it; she knew where we were going; she was my doula. She flipped her badge a little and the guys shrugged and backed away. Matt showed up with all the bags and the three of us walked up with me in the chair. 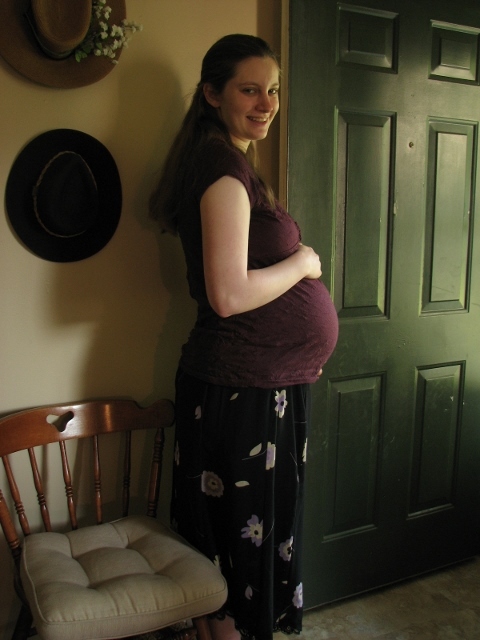 I had several contractions on the way up; I had to get out of the wheelchair for one. I felt every bump--some were really painful. The halls were deserted; I was grateful for that small mercy. My contractions spaced out slightly when we got to the hospital, giving me a little break. When that first one on the way upstairs hit, Sue got right in there and started rubbing my lower back. I just remember how good her warm hands felt. We went to the regular labor and delivery unit first. The nurse we were assigned took all my vitals, asked the necessary questions, and put the monitor on. I asked if I could roll over on my side, not wanting to become too incumbent in bed. I did so, and with the first contraction that hit, the baby�s heart rate dropped really, really low. We didn�t even have time to get worried, though, before it popped back up. I rolled over to my other side, and baby did fine for the rest of the night. I refused the hospital gown, as I preferred to stay in my own nightgown. I knew from Ger�s birth that I would feel less myself and less motivated to move around if I wore a hospital gown. The nurse put the IV in, and it wasn�t nearly as bad in my arm as it had been in my hand with Ger�s delivery. The nurse checked me and I was 4 cm dilated already. This was around 3 am. Beka came at about 3:30 after Mom had taken over watching Ger. The midwife had told the nurse to keep me on the monitor till 4, because of the heart rate drop the baby had had. I asked for a birth ball so I could get out of bed and labored on it for a bit. The nurses filled up the tub, and I changed to a sports bra and got in. The warm water felt really good! Matt got out the LED candles and turned some soft music on. The nurses commented on the nice ambience; I was totally thrilled we didn�t have to turn the bright lights on. Contractions were coming hard and fast, nobody was timing but they weren�t longer apart than 3-4 minutes. I labored in the tub for the next hour or so. Contractions were pretty tough. I started feeling like I couldn�t do it anymore, which was familiar from transition with Ger�s labor. I was afraid to hope I was in transition for fear of being disappointed if I wasn�t. 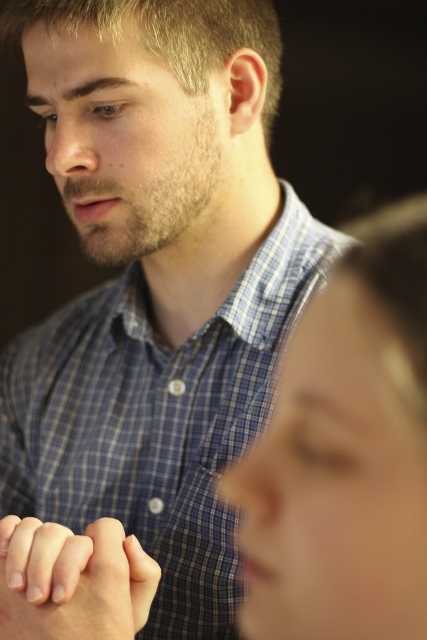 At one point I remember saying, �I can�t do this for hours longer!� Sue�s response was that I WAS doing it; Matt�s response was that he thought we were pretty close. I was told to let someone know when I started feeling pressure. I did during one contraction and someone went to get the midwife. I labored in the tub until she got there, then had to get out because the hospital�s policy is that the midwife has to break your water to check for meconium before a laboring woman could get in the water to deliver. 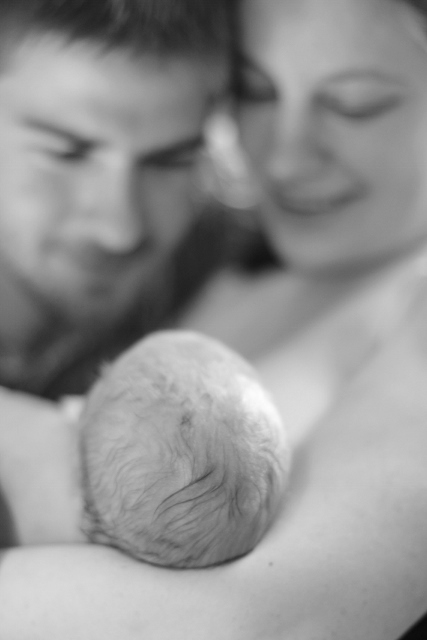 However, Matt and I had agreed that it was more important to us that we let my water rupture naturally than that I get a waterbirth. The midwife checked me and I was completely dilated save for a small lip on one side that she said would get out of the way for pushing. She picked up that we didn�t want to break my water and even said I could go back to the jacuzzi, but that if I started feeling pushy in the tub that was a problem. I didn�t want to do anything; I didn�t want to make any decisions; I was just miserable. Sue suggested Matt and I slow dance. It was more like hanging on for dear life! Contractions were intensely painful at this point, and it hurt to hold myself up during them. Poor Matt nearly got pulled over a couple times with me hanging off his neck. I was so tired between contractions. I felt like labor would never end. My mind felt so pain-fogged. I just wanted to give up. The pain was excruciating down low in my tummy during contractions�looking back I think it was the baby�s head coming through my cervix. I really wasn�t that encouraged by knowing I was fully dilated�I still felt like it would never end! 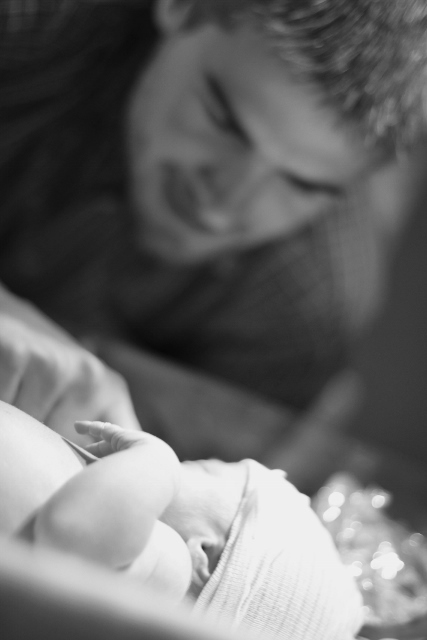 I became pretty unresponsive between contractions; I just didn�t want to deal with anything. Sue suggested I labor through a couple contractions on the toilet. I think she was trying different positions to help that last lip dilate. The contractions were so intense I didn�t know what to do with the pain. Sue helped guide my vocalizations at several points to keep me from hyperventilating. We went back to the bed and I climbed up on my knees facing the back of the bed. I was basically throwing myself around during a contraction from the pain. Nothing helped. I gripped the top of the bedframe, needing to do something with all that pain. I started feeling the urge to push in little spurts during a contraction. Those contractions and the ones right before were the worst of the entire labor. They just HURT. Then the pushing urge hit in full force. I turned myself around in the bed in order to assume a more effective pushing position. These contractions I could handle better as they gave my something to do with the pain. They still hurt a lot but I now had something else to focus on. I think I pushed for about 20 minutes. It was really, really hard work. 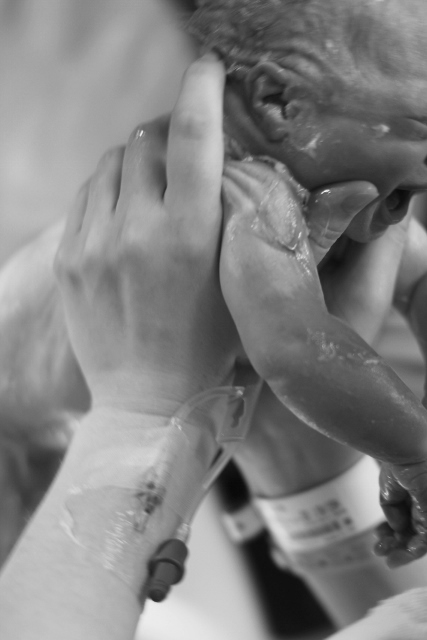 The midwife told me she could see the baby�s head, and I reached down to touch. I was disappointed with how far away she felt! But then more pushing followed, and I was otherwise occupied. Crowning was intense. The contraction stopped and her head sat right there. Boy that hurt! I knew when to stop pushing from Ger�s birth and I felt her head slowly ease out. VERY intense sensation! I wanted to be done when her head was out, but I knew I was so close at this point, that I was almost really done. I gave one last hard push and her shoulders were born. 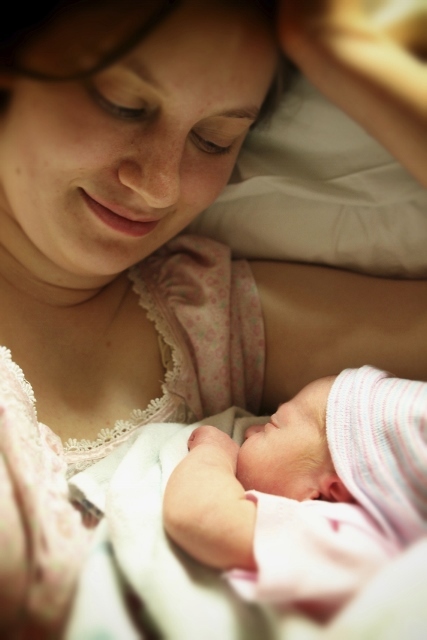 The midwife said, �Reach down and get your baby, mama.� And I did! 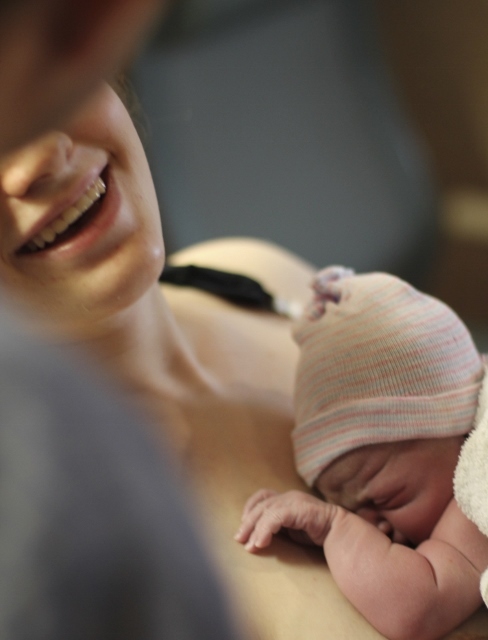 I pulled her to me at 6:35 am, 6 � hours since it all started in earnest. Eldora Rose had very light hair; it looked really red. It took everyone by surprise, including me! I had mentally prepared for a dark-haired bundle, but did not expect this one! Ellie took her first cry but was quiet almost immediately, just taking everything in. She started rooting after ten minutes or so and latched on to nurse as easy as could be! 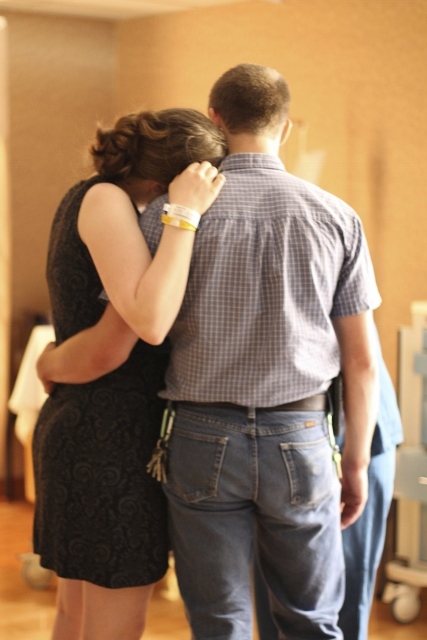 Her cord pulsed for a little longer, then Matt cut it when it stopped. 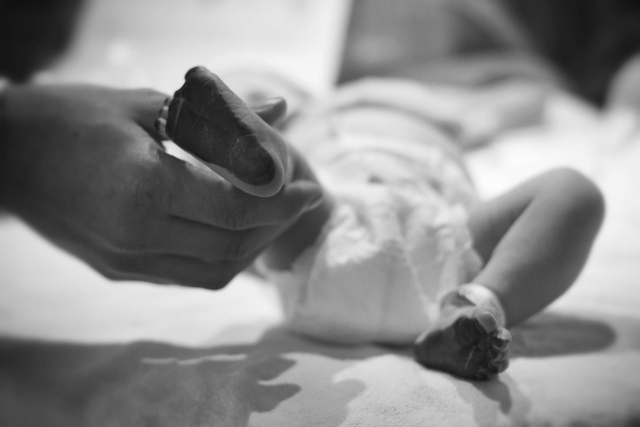 The midwife checked me for tears: none! Hurray! I snuggled with Ellie for a while (hour and a half? Blissful time!) before I consented to getting out of bed and cleaning up. Ellie was weighed and measured at 7lbs 2 ozs and 21 inches. She got a sponge bath and that upset her more than her vitamin K shot! 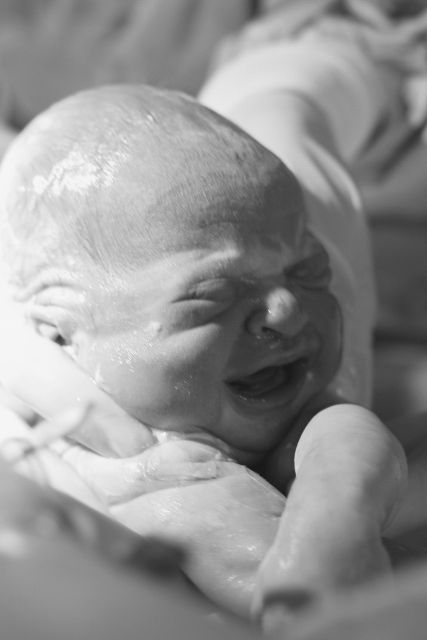 I felt terrific after the birth. Matt said I was glowing. I was so happy it was all over, and I had my little snuggle bundle at last. I am so thankful for the birth experience we had. I was able to have the initial bonding time with Ellie which meant so much to me. In fact, she never left our room the entire time we stayed at the hospital! Our midwife was great and our doula was amazing. I am also very grateful for the loving family surrounding me that made it possible for Ellie's birth to be a positive experience. I never could have done it without my loving husband, who was my rock and biggest cheerleader throughout the whole thing. I'm so glad we were able to share the birth with my sister-in-law 'Beka who was there to give Ellie her first auntie-cuddling...she devoted a lot of time and gas money to help us at the birth and in the weeks following while I was recovering at home. My sister-in-law Rachel also really wanted to be in on the auntie-cuddling, but unfortunately distance was an issue; she was missed, but we sure felt her constant, fervent prayers! My brother-in-law Tim got up in the wee hours of the morning to drive Mom Aardsma to our house (in fog, no less!) so she could watch Ger during Ellie's birth....and then Mom Aardsma watched Ger at the farm (he loves it there!) during the remainder of our hospital stay. It was such a relief to me to know that Ger was with people he loved and trusted (and never seemed to miss us)! And to those who weren't necessarily directly involved but upheld us faithfully in prayer and showered us with thoughtful gifts...A big thank you!! The hospital stay waiting until we could come home was�well, we won�t talk about the construction work going on in the rooms directly above us all day, nor the night where neither of us got more than a couple hours of sleep. I prefer to focus on the precious, beautiful moments we had, like the evening after she was born when we got the LED candles back out and turned the lights off and the soft music on and sat next to each other on the couch and drank in the sweetness of our new baby. Or when Ger came to meet his new sister and was far more interested in the buttons on the bed instead. Or the ecstatic high I was on just after she came, just bubbling and glowing and very, very happy. Thank you, Daddy in heaven, for your beautiful gifts. This last Monday we had another midwife appointment. Everything still looks great except that I am now measuring small for dates--my tummy measurement has not increased in the last three to four weeks. While still not a major concern, there is a small possibility that something is going on that is affecting Little Miss' growth or that I have a low fluid volume. We have scheduled a growth scan for next Monday. They will look at my fluid volume and take measurements to estimate her weight. I have been doing a lot of research on the topics related to this issue and I've learned that there is a 15% error rate with the ultrasound weight estimate. This means that if they give us an estimate of 6 lbs, then she could be 6 lbs plus or minus 15% of 6 lbs--which could be up to a whole pound off either way! While there is a high error rate, it remains the best way they have of estimating her size. 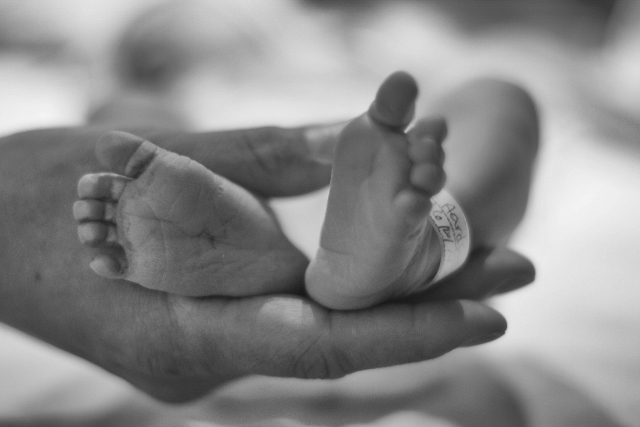 If she comes in under the 10th percentile for her age (meaning 90% of babies her age weigh more than she does), which will be 39 weeks at the time of the scan, then she could be diagnosed with a condition called intrauterine growth restriction. I believe this 10th percentile mark would be at around 6 lbs for a 39 weeker...in other words, if she's estimated at smaller than 6 lbs, we have a possible concern with her growth. I believe they will also look at placental/umbilical blood flow to make sure there isn't something wrong with her cord or placenta. BUT, all that being said, Matt and I agree that it is highly unlikely that anything is wrong. We're doing the ultrasound as a precaution, but I do not fit into any of the risk factors for IUGR (smoking, drinking, drugs, advanced maternal age, high blood pressure, low weight gain, gestational diabetes...) and it's pretty unlikely that after she's grown well this far into pregnancy that there is something wrong with the cord or placenta. The midwife didn't seem overly concerned at our visit, agreeing that it is entirely possible and likely that Little Miss is just naturally genetically small. 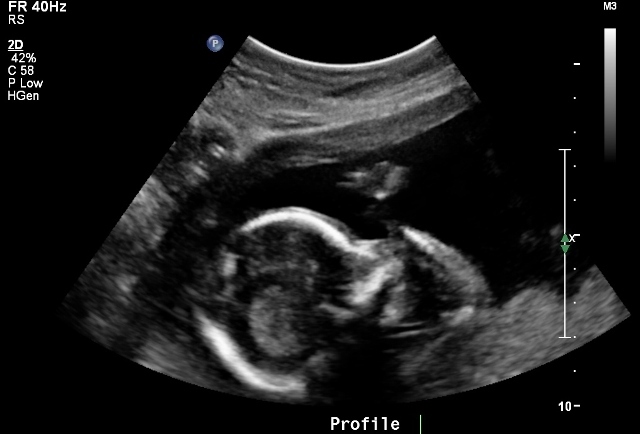 The baby has still been moving well (though maybe a little less than in prior weeks) and her heart rate has been fine at all the visits so far...everything points to a perfectly healthy, though small, baby. To the best of my knowledge, until something is confirmed to be wrong, I remain low-risk and am still cleared for the waterbirth. Phew! It's been a little bit of a roller-coaster ride the last couple days. I keep switching between being very scared that something is wrong to feeling confident that everything is very much fine. On a much less solemn note, Ger is becoming quite the monkey! 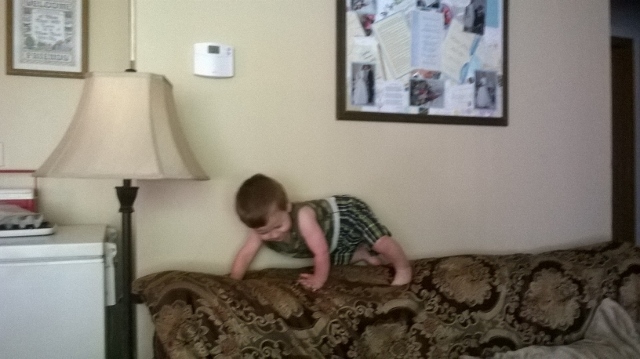 He climbed up on the back of the couch the other day, trying to reach the thermostat to push the buttons. He never quite got there, but it was hilarious to watch him try! Then this morning he climbed up on a chair all by himself for the first time, trying to get to the cereal boxes on the table. I removed said boxes, then turned around to find the child ON the table!!! Ahhh! Nothing is safe from him anymore! He is also starting to be fascinated with outlets again...I found him trying to stuff the clip on the dog leash into an outlet this morning. He has definitely learned the word "Buddy" and uses it all the time. 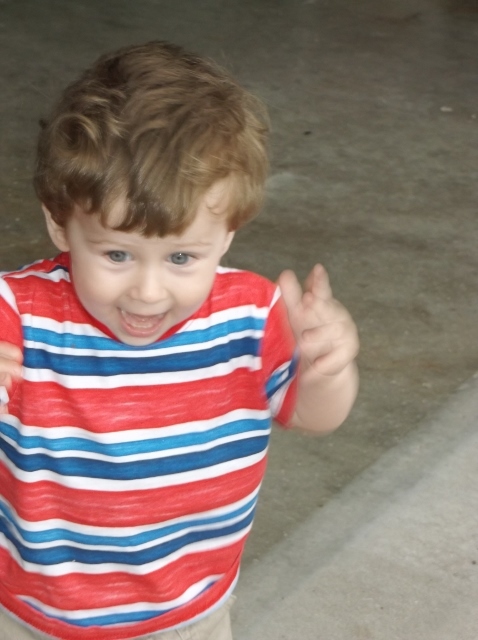 He's also learned "Dada" and "stinky" and copied me when I said "button" just the other day. He also says "thank you" (it sounds more like "dih dah") whenever he hands someone something--he got it a little backward when I started saying thank you when he would give me something. He understands WAY more words than he can say, including "outside", "shoes", "feet", "food", "milk", "snack", "nurse", "no", and "book". It's hilarious seeing his reactions to some things. He's starting to understand what I mean when I say "Dada's home!" Once I said that and he ran to the door and tried to open it. One day this past week I said that and Ger just looked at me blankly. I repeated myself several times to no response. 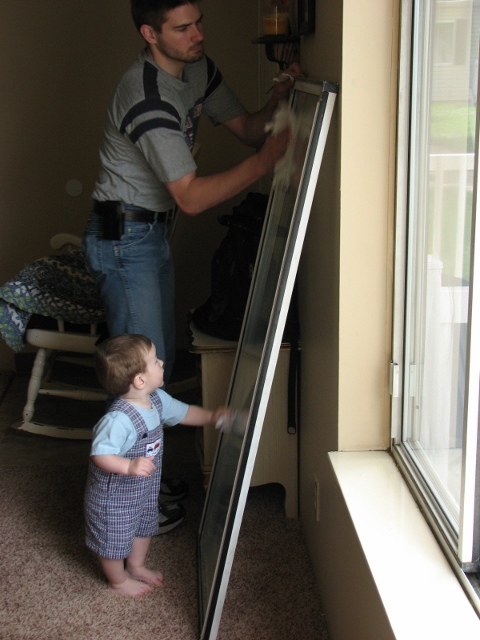 Then Ger got a glimpse of Matt walking up to the door and jumped to his feet, exclaiming "DADA!!" When Ger hears the bathwater running, he will come into the bathroom and start frantically trying to pull his clothes off and climb into the bathtub all at once. He's definitely connected that the clothes are supposed to come off for the bath! 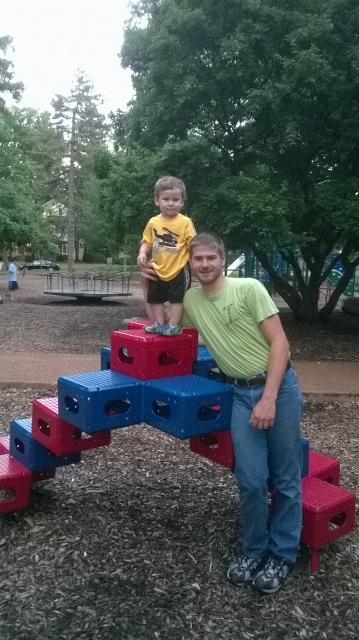 With Daddy at the park. He's also connected that shoes=going outside. When I put his shoes on, he will run over to the door and stand there trying to open it to go out. 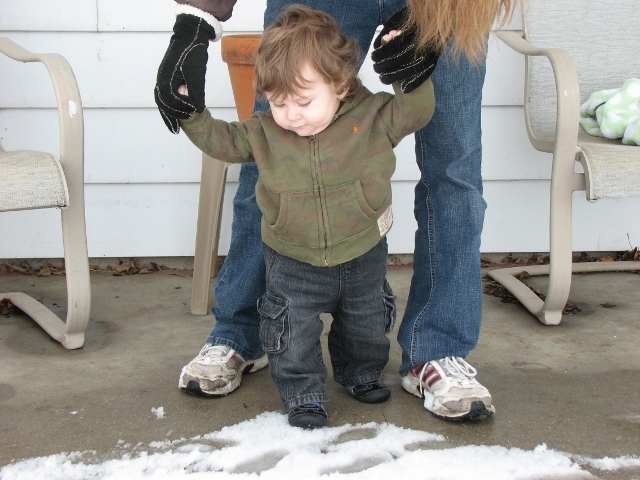 A couple times he has brought me his shoes then stood there lifting his feet up as high as he could so I would put his shoes on him...all with the intent that once the shoes go on, he gets to go outside. And when I mention a "stinky diaper"? He knows to run for it! Love you all. Your prayers for the upcoming ultrasound and birth are much appreciated. P.S. 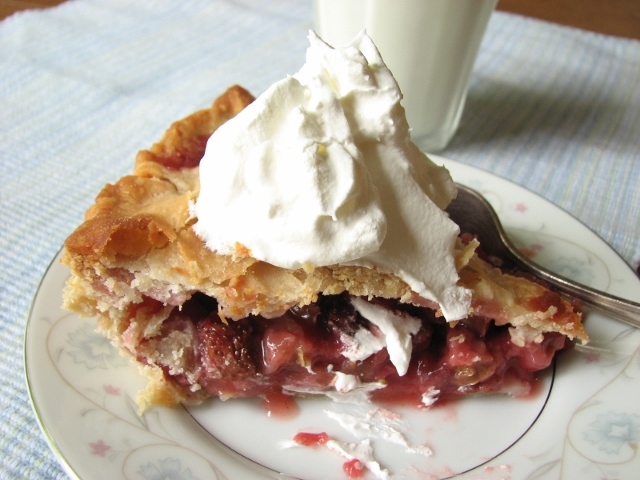 I made a rhubarb strawberry pie that was REALLY good! Recipe here. Today is a big day for us! We made it to term!!! Hooray!!! Ger is also 18 months today. Hard to believe he's getting so big! I have officially reached a point in pregnancy I've never gotten to before, as well as tipping the scales at 170 this week, a first for me! Ger is picking up words at an astonishing rate. Much of the time he seems to be trying to say things and I just can't quite catch the gist of it. He has definitely learned "Buddy" and is consistent with it now. 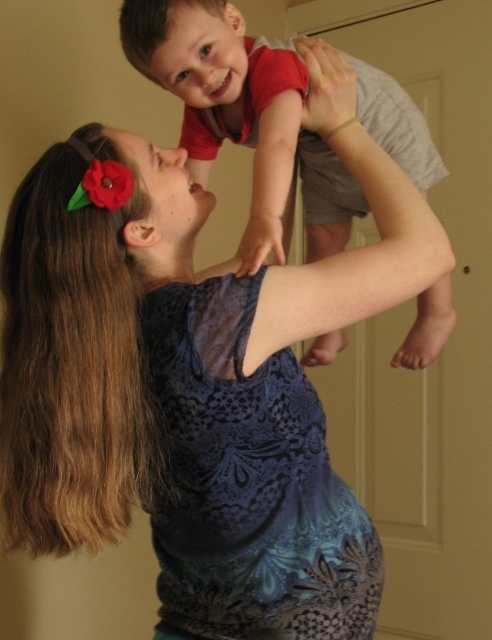 This morning I was letting him play with a hair flower and he coherently copied me when I said "pretty". A few minutes later he pointed at the lamp and I am sure that I heard him say "light". Occasionally I think I hear something along the lines of "What's that?" It's so fun having a talking child! Ger loves to be helpful. He steals my cooking utensils off the counter while I'm cooking, takes my scissors and pushes buttons on my sewing machine when I try to sew (not to mention climbing into my lap), pushes the laundry baskets around when I'm trying to unload the dryer, and crawls under the sheets to play peekaboo when I'm trying to make the bed. He loves to undo whatever I just did! If I just set the table, I'll come back to forks and plates strewn on the floor. If I just put his toys on his shelf, he'll immediately come over and pull them all back off. If I put the dog leashes away in their drawer, suddenly they become the next most fascinating thing and they come right back out. 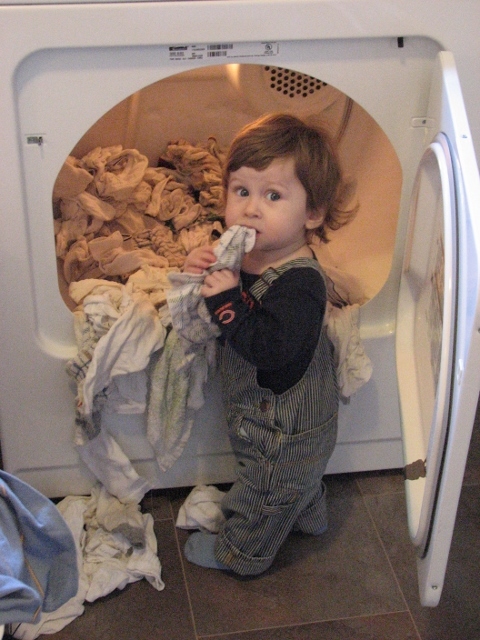 If he sees me put his clothes away, he will come over and start pulling out what he can reach--his baby sister's clothes. Sigh. I'm getting really good at waiting until he's not watching, then hurriedly putting items away hopefully before he catches on! My very own cutie pie! Somebody can reach up to the counters now! We had a midwife appointment on Monday that went really well. Baby was head down again, heart rate good, still measuring right on time. I requested that they do the strep test since Ger came about the same time as my next appointment; results should be back to me by this weekend. I also had my birth plan approved by my midwife and put on my file. We met the new midwife as well and really like her. 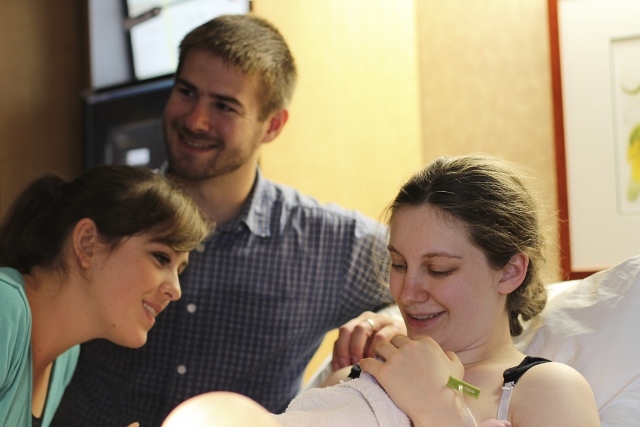 The midwife's parting statement: "You stay pregnant, now!" Please pray that I would stay pregnant for at least another 2 1/2 weeks! Labor and delivery would be much less difficult if I were to make it to term. I wouldn't be under constant monitoring (which I hated during Ger's labor...looking back the midwife made it easy on me) during labor, but even more important to me is the fact that if this little girl shows up early, she will be taken away immediately after delivery for a period of time for observation. I so want to have that initial bonding time...please pray that I would trust God with all of this and rest in his wisdom and timing. Ger has really been enjoying the squirrels and birds here! 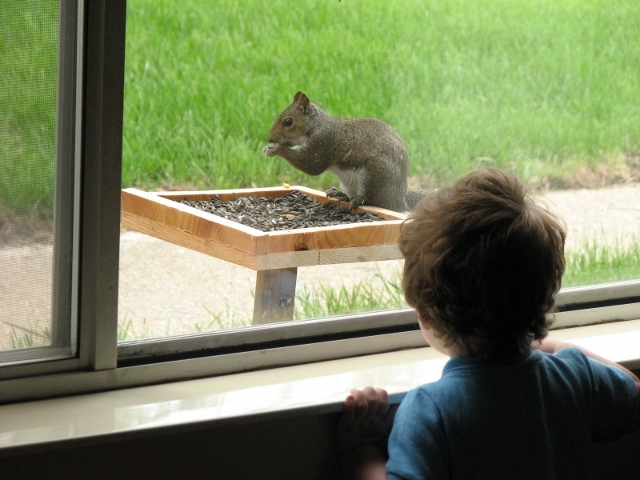 Daddy installed a platform feeder right outside the window. Ger has been growing by leaps and bounds. 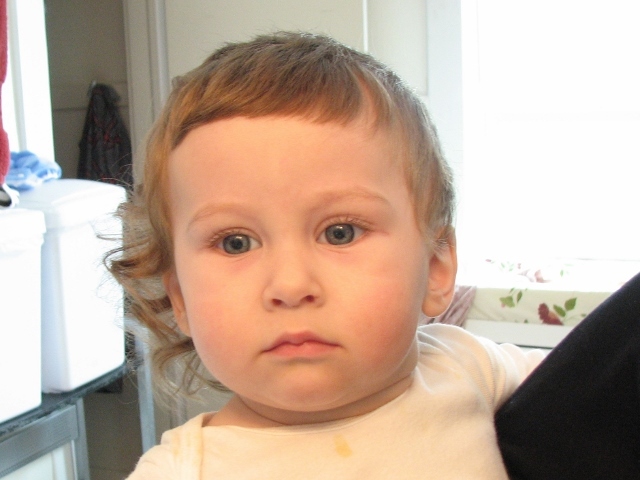 I gave him his second big-boy haircut today as part of my get-ready-for-baby checklist; he had quite the mop on top! I attempted clippers but he started crying because they scared him, so it was scissors for me...but I still managed to do it in 35 minutes, about the same time as an episode of Baby Einstein. I definitely appreciated not having to sacrifice my nap to the haircut. 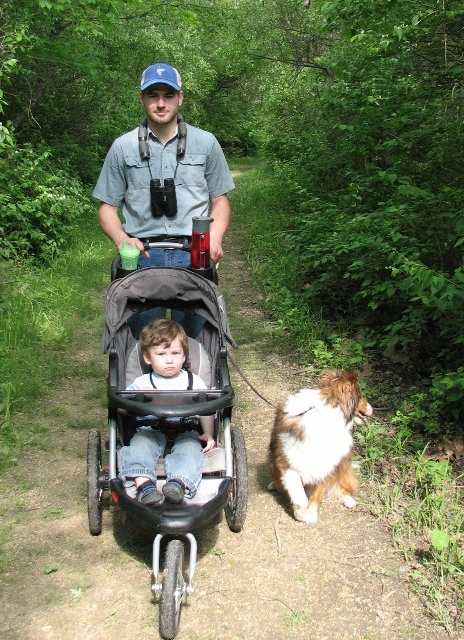 We took our "new" used jogging stroller to a local forest preserve and enjoyed being able to walk the trails with it. Ger's first word: "ding!" We have an older style microwave now, with a timer that does indeed ding. Now when I put something in the microwave to warm it up, Ger will echo the ding at the end for me. He's also recognizably attempted "banana" and "Buddy" but those aren't consistent yet. 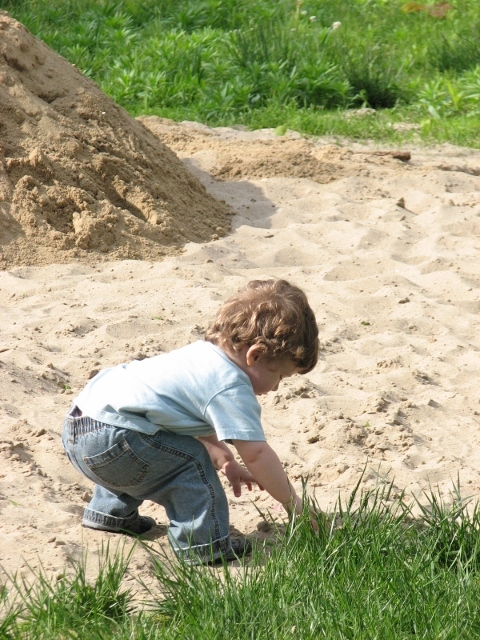 We took Ger to enjoy the "playscape" that they have set up for kids, but he thought the gravel and sand and mulch were still the most interesting part! He's definitely got a retaliatory streak in him; it is not rare now to tell him not to do something only to receive a very defiant look and have him do the very thing forbidden. When spanked for it, he will often again give a very defiant look and then engage in a different forbidden behaviour--often biting, or angrily batting at our floor-length shades, though a couple times he has also repeatedly slammed himself into the kitchen cupboards when prevented from something he wanted to do. Some days I feel like he's always either getting into trouble, crying because he just got into trouble, or crying because he got hurt somehow. Those are rough days! Guy stuff! 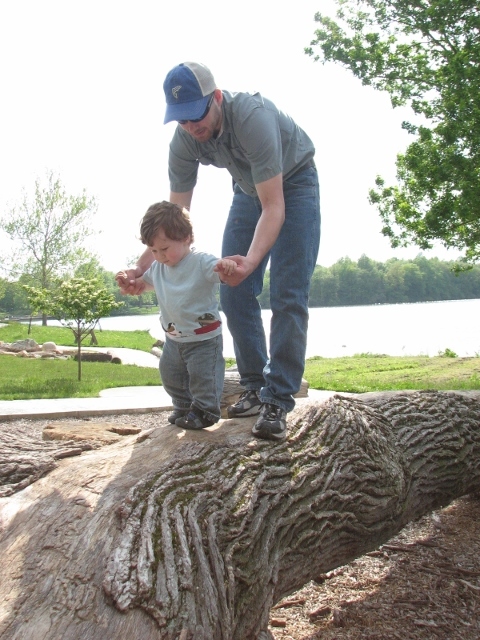 Tree climbing with Daddy. Well, we've made it past the three-quarter mark! 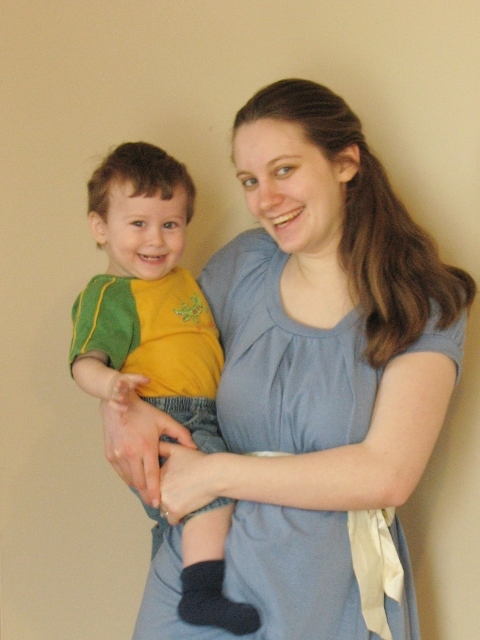 It's hard to believe that Ger was born just a short six weeks from this point in my pregnancy. Ger's first Easter Egg Hunt at Mom and Dad Aardsma's home! and the cats coming up to sniff him were much more interesting. Little Miss continues to be active but her intensity and frequency of movement has definitely decreased over the last several weeks. At our last visit, one of the midwives said something about the nervous system's development in the unborn baby slowing down the baby's heart rate over time (LM's was a tad lower than usual at our last appointment, not outside of normal ranges), and I'm guessing that it would make sense for that same development to affect movement as well. What Ger does a lot. Goof off. Little Miss was not head down at our last appointment, and I'm trying my hardest not to worry about it as there is still plenty of time for her to turn. I guess that her position would explain the Grapefruit-Under-My-Ribs! Playing with Buddy, our dog. Life is absolutely crazy right now. We are selling stuff as fast as possible on craigslist to downsize to a two-bedroom-condo capacity, which we will be moving into in about two weeks' time. Yes, we will have gone from deciding to move so Matt could focus more on his degree to being moved in less than a month! We decided that we needed to do it as quickly as possible in order to be totally settled before the baby shows up. (Having a baby and having still-packed boxes everywhere? No thanks!!!) Even though it's a little crazy, the timing will work out well because our lease will be up next May instead of next August (due to being a university town, most leases in our area run Aug to Aug) which will allow Matt to have a summer internship wherever we're going before starting his PhD in the fall of 2015. While moving is emotionally difficult on some planes, I am excited about not having stairs! No more laundry lugging, stair-related baby-climbing safety concerns, stair vacuuming (extremely difficult when 7+ months pregnant), and nightmares about falling down the stairs while carrying a newborn. I never did fall with Ger, but I was terrified for the first few weeks that I was going to! I am also looking forward to having a smaller place to clean; I'm hoping that it will be easier to keep up with than this big old house. Here, I think about all I have to do and get discouraged before I even start! 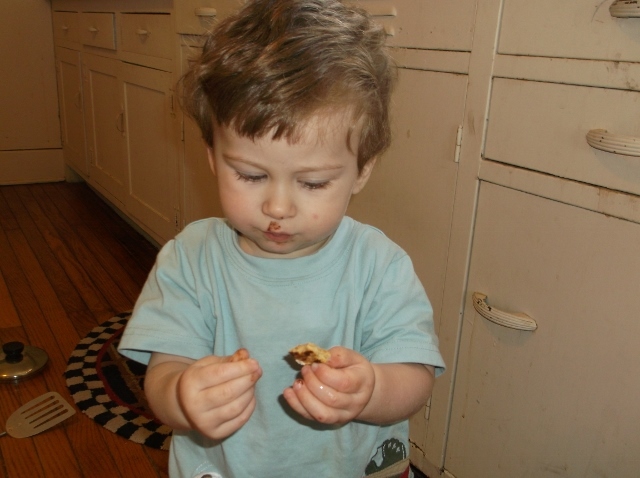 Taste of S'mores, one of Mommy's favorite snacks! Hope this fine weather finds you all in good spirits! Winter felt so long; I am loving the change into spring! Ger is also loving it. He now lives to be outside. Even when he's inside, he is often found peering out a window on his tiptoes, chattering back to the birds and the breeze. 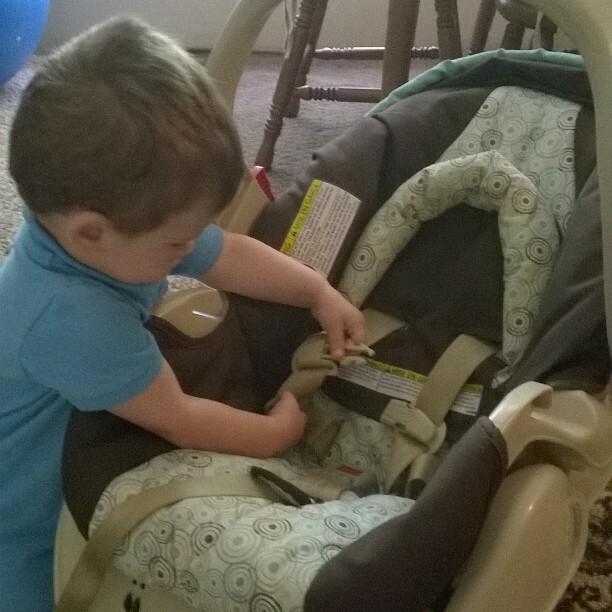 Ger is a very big helper these days! He is learning by leaps and bounds, particularly in his copying. He has learned to help put his blocks away, help me put laundry in the dryer one piece at a time, push Daddy's broom around in the garage while Daddy's cleaning, drop toys into the bathtub and down ductwork, take the covers off of the register vents in an attempt to recover the toys, take his stuffed puppy on a string for a walk, brush his hair with my hairbrush, use a spoon to put mushy stuff in his mouth, draw using pencil and crayon, put lids on containers, and take my shoes off and put them back on my feet when I'm sitting on the couch. He's also learned to hide behind the rocking chair when Daddy chases him, popping out only when he knows Daddy's coming for him. And this morning, the ultimate in cuteness! He saw Daddy doctoring up my foot (small puncture wound from a little piece of fine wire) this morning, and when Daddy gave him a little strip of adhesive backing from the band-aid, Ger vigorously attempted to apply his little "band-aid" to Mommy's foot too! Even when it didn't stick, he still kept trying! Truly adorable moment. I am 28 weeks along today!! 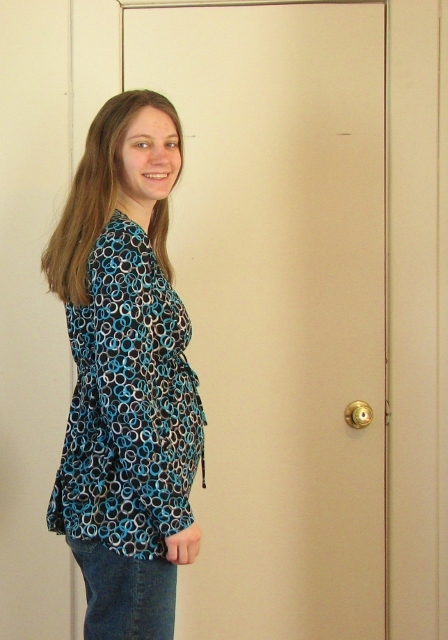 This marks the beginning of the third trimester! Woohoo! Two-thirds of the way there! This last week or so seems to have flipped a fairly large switch for me physically. I went from feeling great with very few complaints to definitely feeling big, having a harder time getting comfortable at night, feeling more achy and crampy (still not too bad, some days are worse than others), having a harder time falling back asleep when I wake up at night, feeling more short of breath and reflux-y, dealing with more stomach upset of the indigestion sort, and having more trouble with sciatica. But, I still am feeling pretty good, and I think that I am doing even better than I was at this point with Ger's pregnancy. Under-gaining weight for the pregnancy doesn't seem to be a large concern anymore, especially since I weigh less than ten pounds away from what I weighed at the end of Ger's pregnancy. I think this baby's going to be bigger than Ger...but his 5 lbs 10 ozs won't be hard to beat! 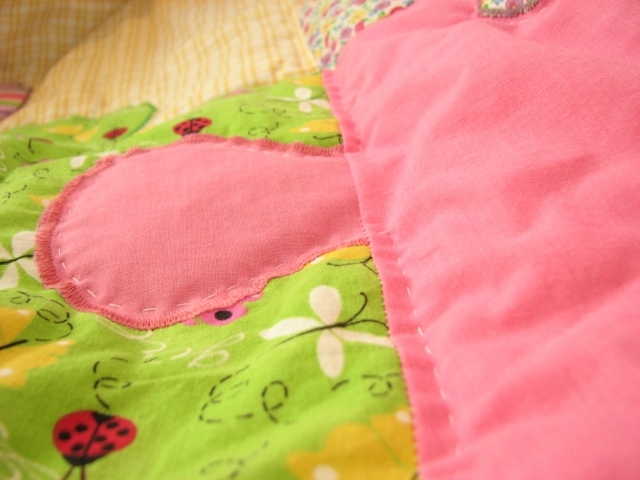 Sneak peek of the baby quilt in progress for Little Miss. I have tried several new recipes in the last several weeks. A couple of them bombed but I discovered that I can make really (!!!) good General Tso's chicken...particularly with the bottled sauce from GFS that takes most of the work out of it! Sorry, no pictures, but the recipe is here: General Tso's Chicken. I ignored the sauce part but followed the other instructions and just dumped the bottled sauce on the chicken in the skillet and served when heated through. We both LOVED it!! 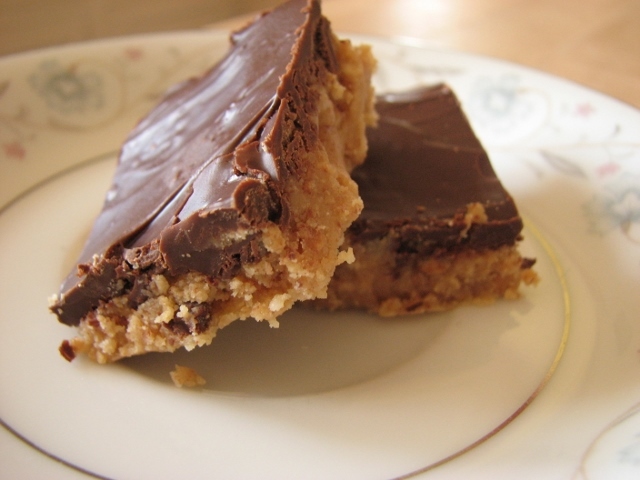 I also found a peanut butter bar recipe that I really like: Peanut Butter Bars. They're just like the Reese's peanut butter cups, just in a pan! Caution: very addictive! It's hard to believe we're already at 25 weeks! It's been a rough week with teething (all four canines at once, anyone? And they're supposed to be the worst!) and vaccination fallout from Ger's 15 month visit on Monday. Last night was the first night Ger really slept since the weekend. Three hours of sleep at a time= total bliss! 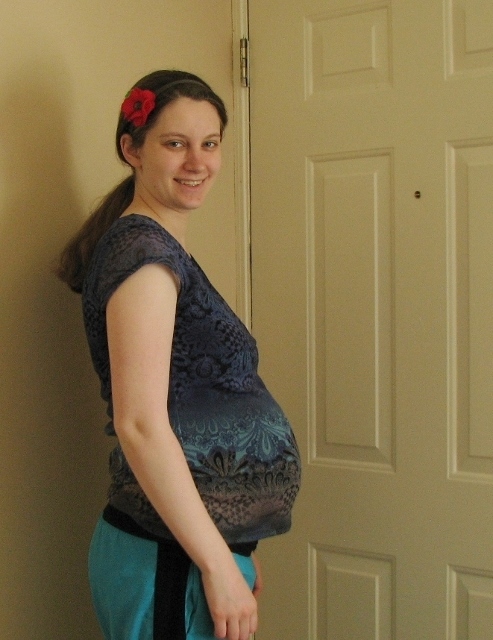 My 25-week midwife appointment is this coming Monday. I don't anticipate any issues; Little Miss has been very active and consistently so. I am looking forward to hearing that little heartbeat again, though! 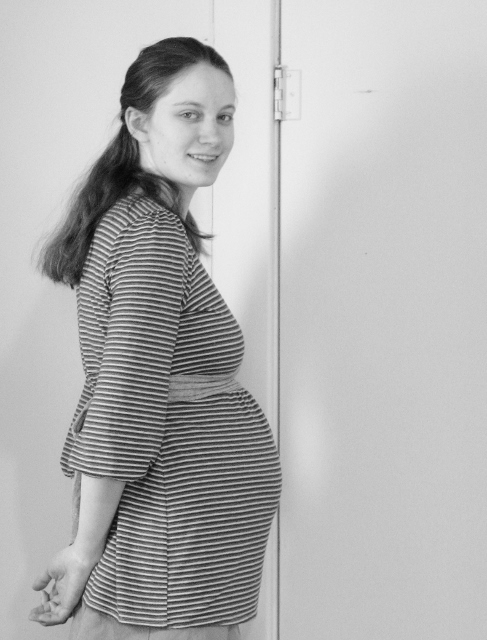 And a little shocker: I realized that it would be a wise thing to be totally prepared for this baby to come by about 35 weeks, since Ger came a little bit after 36 weeks. And since I'm 25 weeks now...you can do the math...all of a sudden 10 weeks is a very short amount of time!! Ahhhhh! Looking forward to meeting our little girl. Little Miss is doing well, growing and kicking away! I showed Ger a couple videos of newborns last night and this morning, so now he's working on the word "baby". Progress, even if it has no particular meaning yet! When Ger started reminding me of a mophead, I had a feeling it was time. I sacrificed my nap yesterday and started snipping away. I almost cried when I saw all his adorable curls coming off. However, when I was about two-thirds done, he woke up prematurely, putting an end to the haircutting session. Daddy did quite the double-take when he came home! I finished it up today, and boy does Ger look grown-up now! I hated the shortness at first, but after the 24 hrs with a very rebellious-looking 15-month-old, I am relieved to have it looking decent at last. He's even showing off his funny face for you! 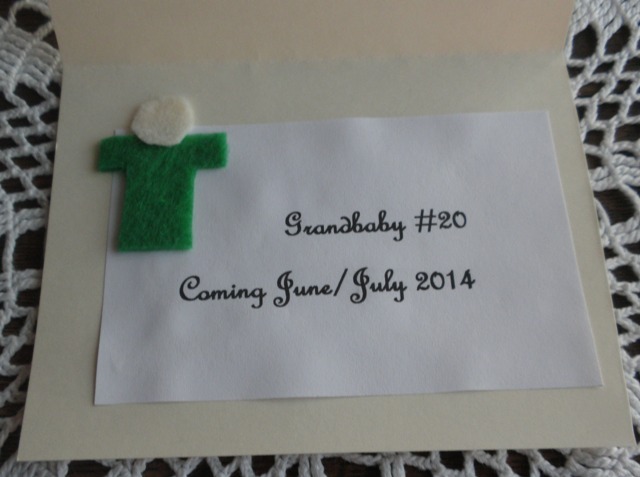 Twenty weeks is here...and flying by! The official halfway mark!! All of a sudden the reality is starting to hit that in a few short months we will be adding another member to our family. Our ultrasound took place yesterday afternoon. Baby's heartrate looked good, everything looked normal, and weight is 11 oz which is very good for 20 weeks. We had the ultrasound tech write the baby's gender on a piece of paper for us, and then we went to our appointment with the midwife. While there I asked about the hospital's policies on older siblings during labor, and received the very good news that Ger can be with us during labor if we so choose! Yeah! Then we stopped by the florist's and opened our piece of paper together. Matt had the honor of reading that it's a...! I picked out a rose and had it wrapped up for Grandma Aardsma. We drove to Loda and kept everyone on pins and needle until we'd taken care of changing Ger's diaper, getting a snack, etc. 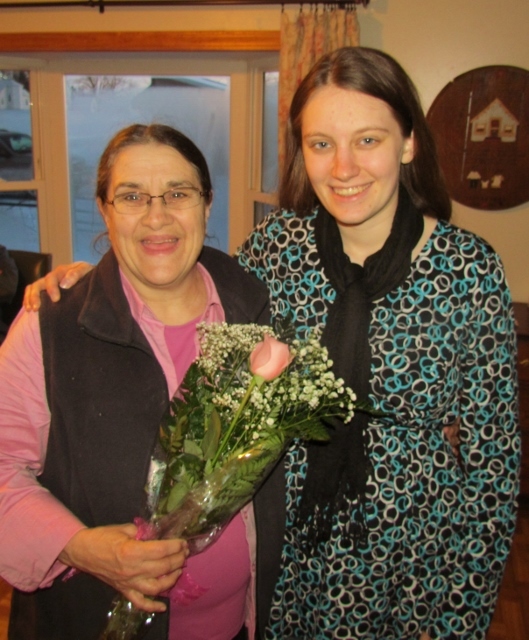 We presented Mom with her early Valentine's Day flower, a little pink rose ...from her littlest granddaughter!! We are so excited to be having a little girl. I think we will wait until she arrives to announce a name, but I will refer to her as "Little Miss" for the time being. I've been feeling much more movement from Little Miss in the last week. I had just told Matt that I was starting to be concerned that I was not feeling more movement, when I got a kick. And then a little bit later another one...and I've been feeling them more consistently since. Naptime and bedtime are still the main activity times, but I have started feeling kicks occasionally throughout the day too. I think the ultrasound tired her out--she didn't like the pressure from the probe much--as I haven't felt a whole lot since then. I am starting to feel the pregnancy slowing me down. Climbing the stairs while carrying Ger is particularly breath-taking. Bending down to the floor is getting more uncomfortable, and sleeping comfortably is getting more difficult...though with continued disturbed nights, getting to sleep (in between going and getting milk for Ger, that is) doesn't seem to be a problem. 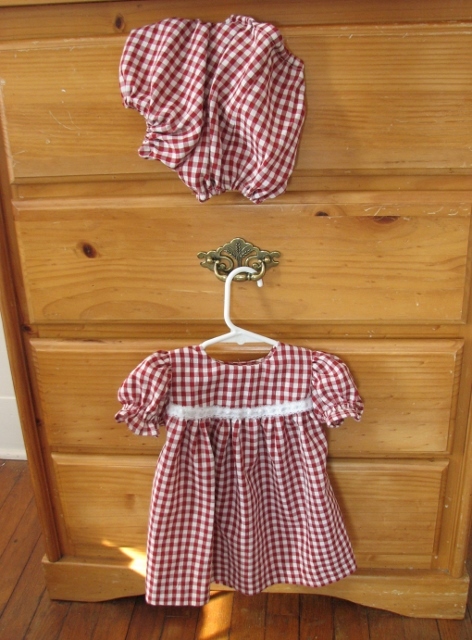 I decided to do a little sewing for the baby...and made a little dress. This was before our ultrasound, as I realized that if we found out at our ultrasound that it was a boy, then I would no longer have an excuse to make anything for a girl. I had fun...and now I get to have more! Ger has been super fun recently. It's amazing how he can be so cranky at night (5:30 am is the worst!) and then be as happy as a clam when he wakes up! His antics keep us laughing and shaking our heads in disbelief, alternately. 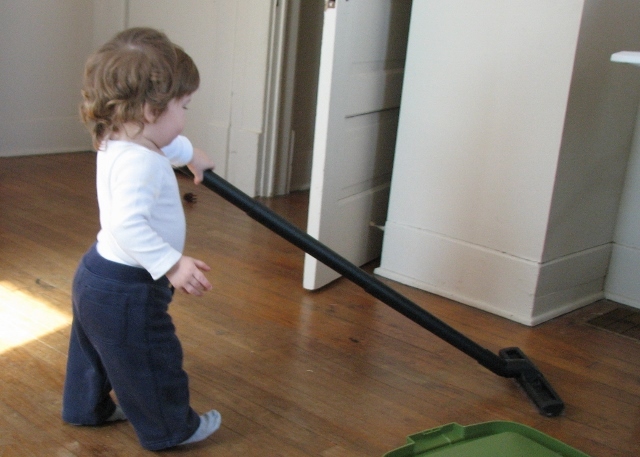 The funniest thing this week is that he has taken to copying the way in which I vacuum the floors. I have a floor sweeper attachment with extensions that I like to use, and Ger LOVES to pick it up when I'm not using it and sweep the floors with it! It's adorable. 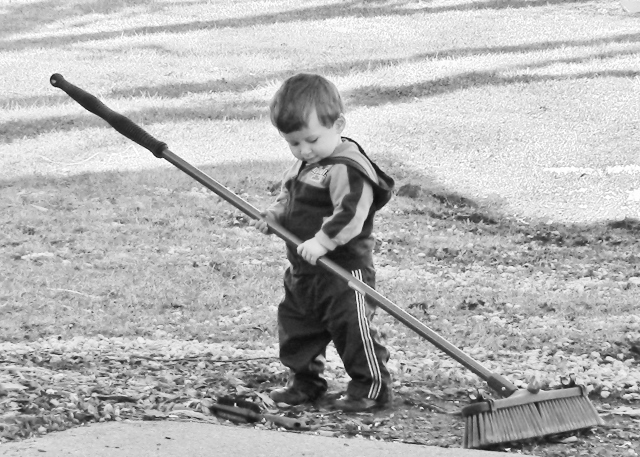 Matt and I agree that he is a very busy child; he's not happy unless he's doing something. My very busy little guy. 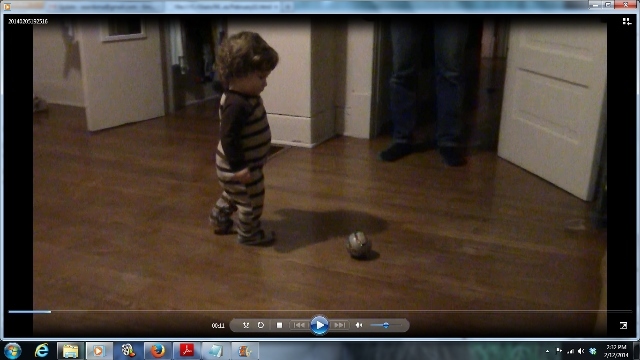 He learned just in the last couple days how to kick a ball. He can't really roll it, or throw it, but he sure can kick. He and Daddy played soccer before bed one night and wore each other out! He also has a very funny face that comes out particularly when we're eating and he's trying to be goofy. He will look at me and scrunch up his eyes while smiling really big with a wide-open mouth...that usually has food in it. Ger has also learned how to tease me. I will offer him food or something to drink, and he will come close to me, acting like he will take it. As soon as he gets within about two feet of me, he will smile and run away, only to return a couple minutes later and repeat. This continues either until I grab him and put him on my lap or just give up altogether. And a first word!...or close to it. He learned how to say "Be-ka" when his Auntie Beka last came by. I don't think that he connected that it was her name, but he seemed to connect it with her being here. He serenaded us with "beka-beka-beta-beda-beka" and other variations the entire time she was here, a little bit the day after, and then none since. Pretty exhausted this morning. I can't wait for naptime!! I made two changing pad covers a while back. I can throw one in the wash while I use the other; it has been really nice to have covers that match the bathroom colors! 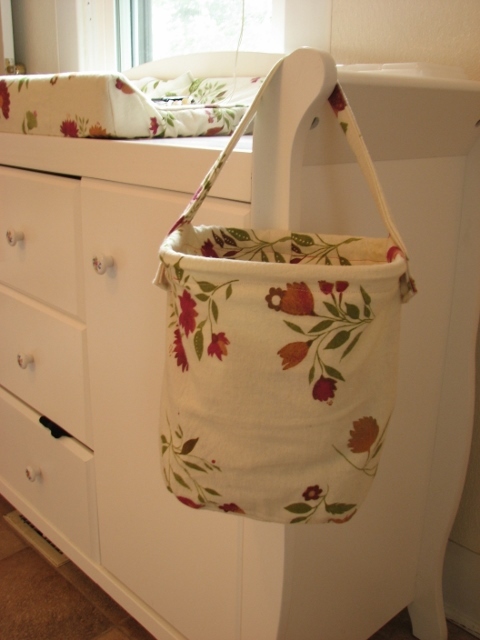 I also made, out of the same fabric, a little bag to hang on the changing table for my wipes to go in. I used the rim cut off of a Glad-type container (of this sort but shallower) to give the top of the bag its structure. I used the rimless bottom part of the container in the bottom of the bag, to help the bottom hold up. Then recently I got the renovating bug (nesting early, maybe?) and spent a couple days working on the guest room/sewing room. 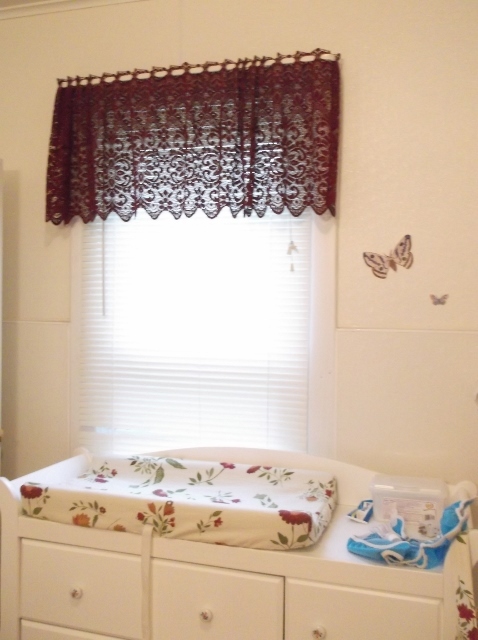 I don't have any "before" photos, but imagine loose trash bags of fabric tucked under the table, quilts that didn't match on the bed, scraggly green curtains on the windows, etc. Photo taken with my new tripod, a gift for my birthday. Thanks Tim and Caleb! 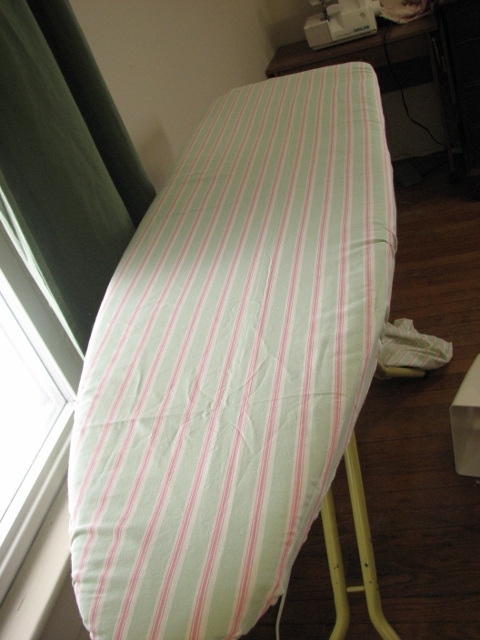 I am particularly proud of my ironing board cover re-do. I got the idea from this post. Again, no before picture, but imagine a fairly faded, scorched, and generally tired-looking blue-with-brown-swirls print. I was a little fussier than the lady in the blog, but I followed her idea of sewing the new fabric down on top of the old cover. It definitely got a little tricky in areas! But don't you just love the new colors? Matthew's comment: "It looks very...stripey! I like it, dear!" And a bonus, if you've made it this far. 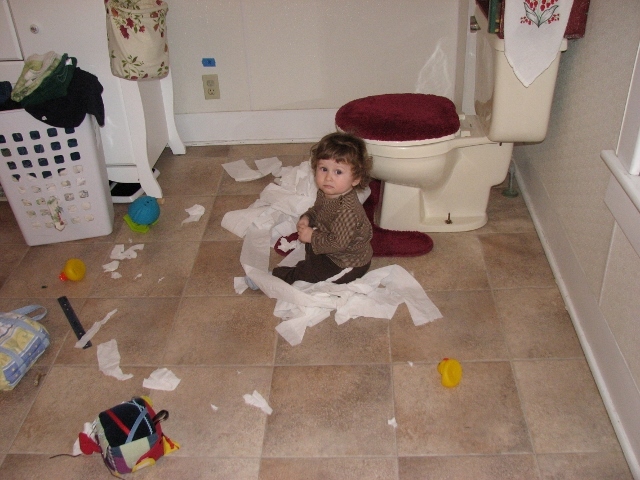 A couple nights ago, in a moment of weakness, I left a roll of toilet paper on the dispenser...Do I have to explain further?! P.S. Excited about that ultrasound next week! I started an email a while ago but then found myself just recounting in detail the recent frustrating experiences with Ger. I found myself at about the five-hundred-pages mark before I decided that you probably don't really want the long version anyway. Short version: We had an unexpected scare with Ger being dehydrated due to (unrealized) decreased milk production due to being pregnant, but we started him on a supplemental sippy cup and everything's okay now. Nights are still rough since Ger wants to nurse multiple times, and I don't have enough milk to satisfy him at even one nursing anymore. But we're hanging in there. It's a lot like having a newborn on a bottle; he settles down once we get a little warmed milk in his tummy. I am finally starting to gain weight. It is such a relief to see the numbers climbing on the scale!! I had started to worry about fetal growth restriction...but considering I've gained about 5 lbs in the last four weeks or so, I'm much less concerned now. I still have a ways to go...I'm supposed to gain an average of over a pound a week, basically until the end of the pregnancy. No pressure, right? 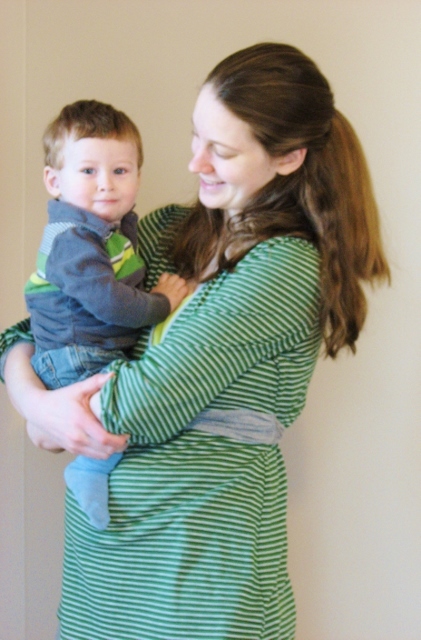 Our big news of the week: We have hired a doula! 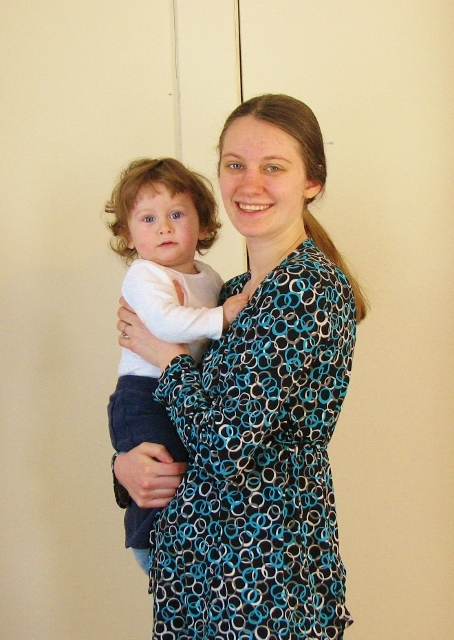 She is very friendly and is super familiar with the hospital and midwife team. And she only lives ten minutes away! When we visited her, she even pulled out her measuring cups and spoons for Ger to play with...scored some points there! We are excited to have her on our birth team. I'm starting to feel a bit more on top of things around the house, which has been nice. It does get a little discouraging, though, when I can tidy up a room only to turn around and find that Ger has pulled everything all back out of the drawers and cupboards again. He's very proud of his (de)organizational skills! Good news! All of my OB labs came back normal as of our visit with the midwife last Friday, and the baby's heartbeat continues to be good and strong at around 155 bpm. I've been feeling kicks already! It's so much fun! 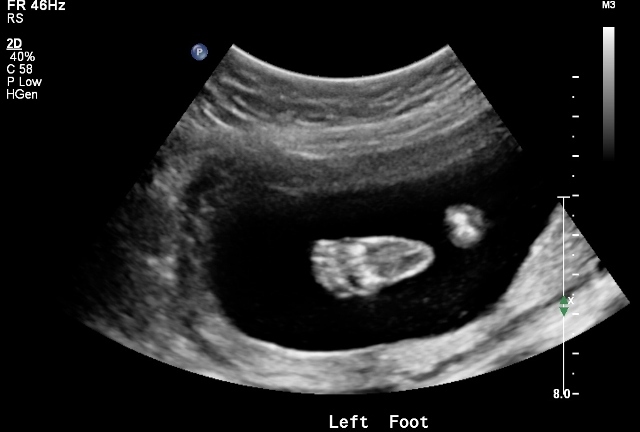 This little one definitely seems to be pretty active; although I'm not feeling regular movement yet, I've already had a couple kicks strong enough to be felt with my hand and a bunch of smaller ones. 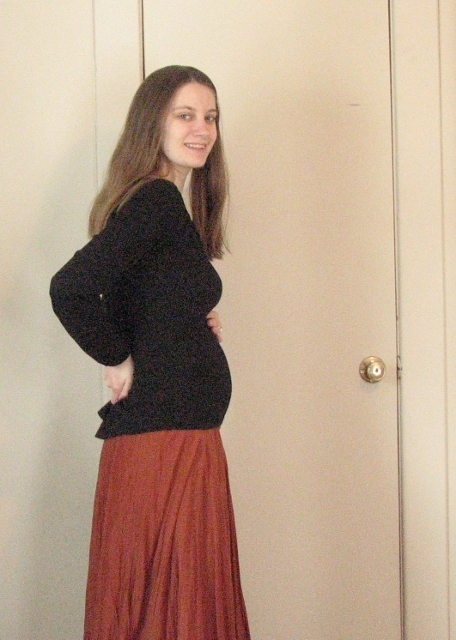 At fifteen weeks and a couple days, it's maybe a little early to be feeling that much movement. All I can say is...I hope this little one doesn't get too claustrophobic too soon, like Ger seemed to. If only he/she could hang out a little longer than Ger did! My 15 week photo. My bump is definitely there full time now. Ger has learned to ham it up in order to make people laugh. It's sooo hilarious!! Matt and I don't quite know what to do with him sometimes! 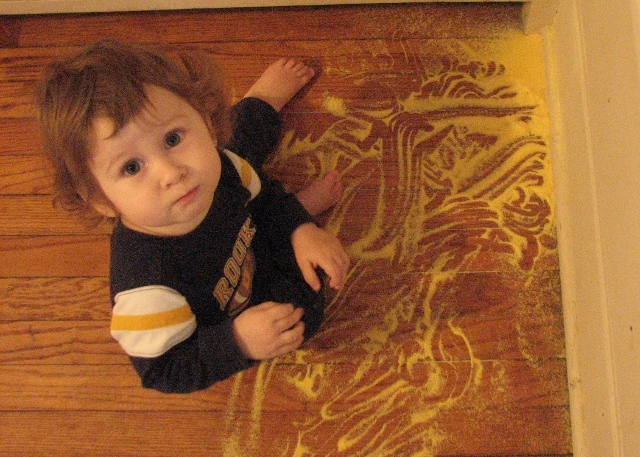 I spilled some cornmeal on the floor. Guess who got to play in it? 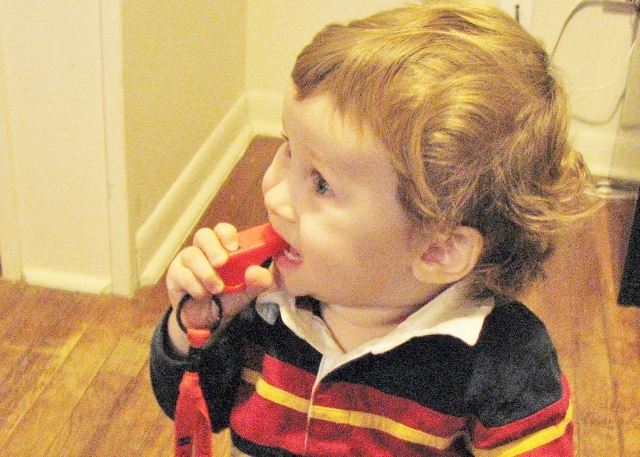 Ger has also learned how to blow a whistle, and "ma-ma-ma-ma-ma" sounds seem to be directly related these days to hunger, tiredness, frustration, and "Mommy, don't leave me!!" scenarios. Like when Matt, Ger, and I were all on the couch and Ger started heading toward me to nurse. I stood up, and Ger frantically started saying "ma-ma-ma-ma-ma-ma!" Hungry baby! Proud of his new skill! We took Ger out in the snow for the first time today. He wasn't quite sure what to think of it! 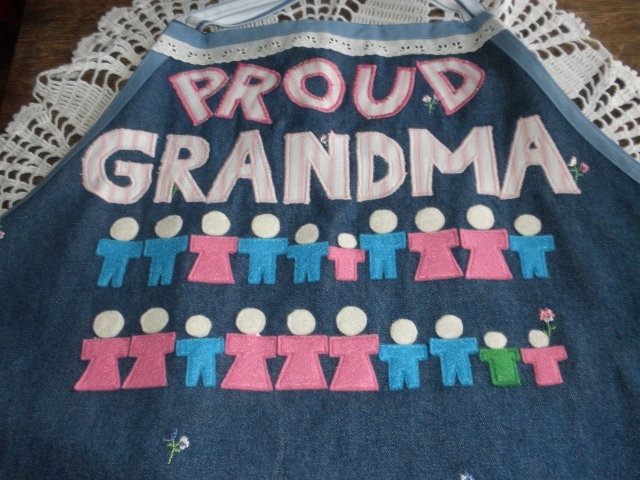 And then Mom opened her second gift: an apron that I made for her. 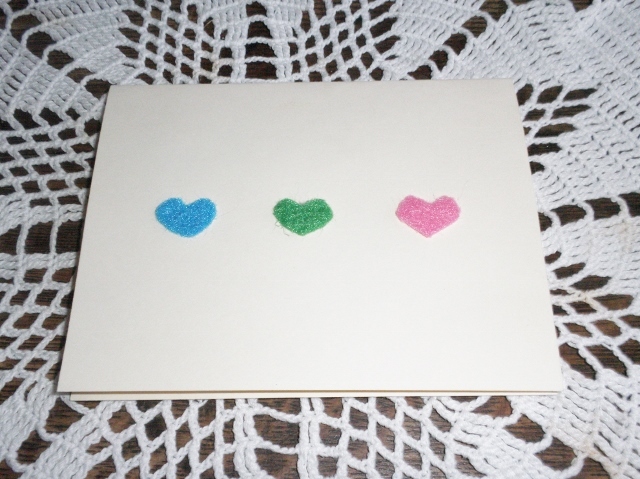 In the pocket of the apron was a card. That's right! Ger's going to be a big brother! We're so excited!